Gabriola’s Folklife Village was originally constructed as the Folklife Pavilion for Vancouver’s Expo 86 world fair that ran from May to October, 1986. When Expo 86 closed, Folklife was dismantled and stored in a Delta field until Steve Wohlleben reassembled it on Gabriola in 1993 as Folklife Village. It would be the biggest structural recycling project in BC. And it would create a new commercial and cultural hub that would transform life on Gabriola. Today Gabriola is the only location outside of Vancouver that can boast an intact Expo pavilion. 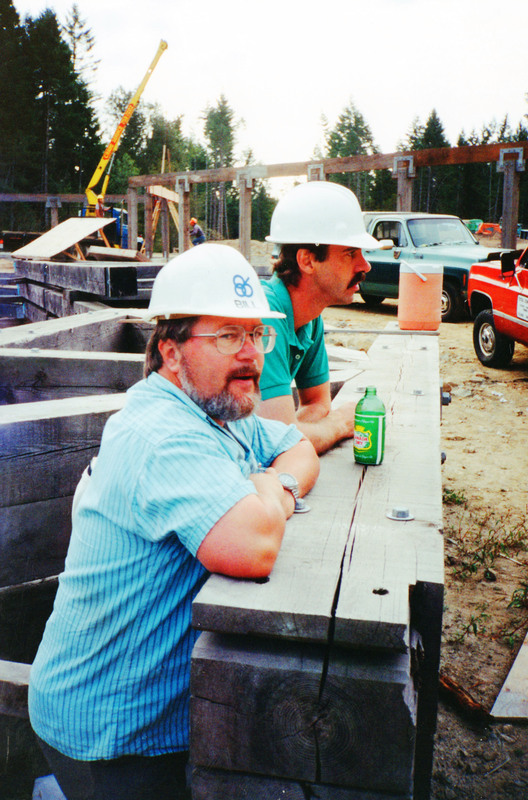 Engineer Bill Kristofferson and developer Steve Wohlleben supervise construction of Folklife Village in 1993. The Folklife Pavilion at Vancouver’s Expo 86 fair was built of old growth BC fir and showcased Canada’s culture, music, dance, crafts and food. Expo’s Folklife Pavilion featured a unique post and beam architecture made from old growth BC fir, that boasted the largest timber truss – 96 feet (29.2 metres) – in Canada. The Pavilion showcased Canadian culture, arts, music, dance, crafts and food, and was visited by more than two million fair goers. Before moving the dismantled structure to Gabriola, Wohlleben had to clear a site at North Rd and Lockinvar, recruit local tradespeople, and figure a way of hauling 27 huge truckloads to the island, as the trailers were too big for the ferry. The trailers were eventually barged into Descanso Bay and unloaded onto the beach, from where they negotiated tight turns, narrow roads and steep grades up to the building site for reassembly. “It was like piecing together a 30,000 sq ft wooden jigsaw puzzle, while juggling finances, site construction and design, permitting, leasing space to prospective tenants, and dealing with a myriad of unforeseen problems,” said Wohlleben. 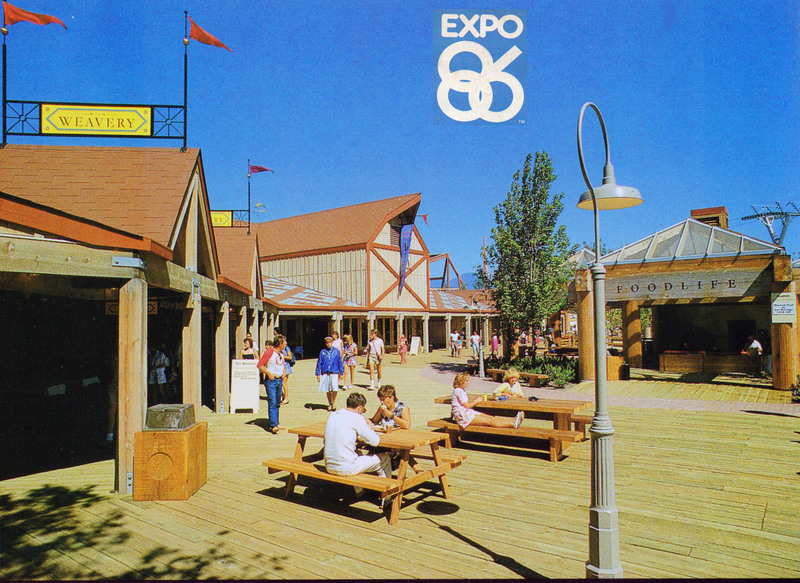 To mark the 30th anniversary of the creation of Expo 86’s Folklife Pavilion and its transformation into today’s Folklife Village, the Gabriola Museum and the management of Folklife Village will unveil a historic panel at noon on Tues, May 17 at Folklife Village.